Serves 2 to 3 per potato used. By Dennis W. Viau; from a fan’s recipe. This is more of a procedure rather than a recipe. 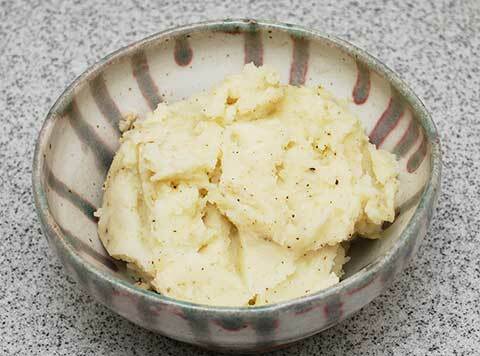 Someone told me an easy way to make mashed potatoes by using a potato ricer and a microwave oven. It really does work well and now this is the only procedure I use for making mashed potatoes. Cut the potato in half the short way, not from end to end. Place on a plate, cut side down. Cook in the microwave oven 6 to 7 minutes — cooking time will depend on the power rating of your oven. Place one potato half in a potato ricer, cut side down, facing the screen. Press with the handles to rice the potato into a bowl. Repeat with the other half. Add butter, salt, pepper, and milk. Stir to combine. Do not work too much, as this can make the mashed potatoes gummy. Serve immediately or keep warm until needed.